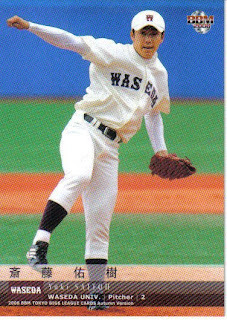 I got a bunch of cards in the mail today from Japan, so I'll be trying to do a bunch of posts on some recent sets in the next week or so. First up is the BBM Tokyo Big 6 Autumn Version set. As I mentioned before, this is a 36 card (plus 1 insert card) boxed set that came out last September. The cards are evenly divided among the six university teams with each team having five player cards plus a team card. (I can't comment on the insert card because I bought an opened set that didn't include it.) 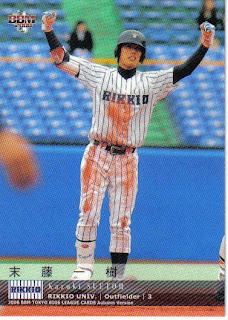 About half the players in the set were also in the larger Tokyo Big 6 set that came out last spring (referred to as the "Spring Version" of course). Like the earlier set, this set is very good looking, with a simple card design and a lot of nice photography. 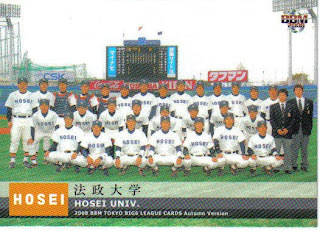 From the top, that's Yuki Saitoh (#08), Kazuki Suetoh (#22), and the Hosei University team card (#30). All the team pictures were posed in front of the new scoreboard at Jingu Stadium.